Chai Tau in hokkien is Radish/Daikon. If i am not wrong, it is the Teochew who would fry them into this delicious dish. I have totally forgotten about this dish until someone who visited my blog and ask if i have a recipe for kway kak. In malaysia it is called chai tau kueh and kway kak could be singaporean. correct me if you please. The hawker version, for economical purposes has no or not much of radish in the kueh. My plate of chai tau kueh would have tasted so much better if i had a bam of chopped spring onions. Mix the ingredients together in a large glass bowl and microwave on high, 2 minutes at the time, stir well, until mixture has thickened. Pour into a 10 inch round cake pan and steam on high heat for 1/2 - 3/4 hour. Using a stickless pan, heat 1 tsp oil and pan fry the diced kueh until very fragrant. (do not stir or turn kueh until it is brown on one side). Remove kueh to the plate and heat the other tsp oil. When oil is hot, add chopped garlic and fry until fragrant before adding the chilly. Add the chai poh and sugar and saute until well mixed. Add in the pan fried kueh and dark soya sauce. 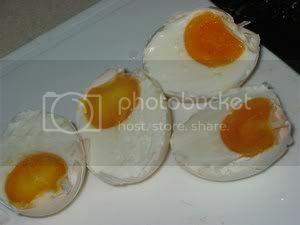 When well mixed, crack in the egg and fry until egg is cooked. Add in the taugeh and stir fry (do not overcook the taugeh). Add in a dash of msg if using and the spring onions. Dish out and dash with white pepper. Enjoy while it is piping hot. When eggs are on sale, i will stock up several packs of 18's. It is the s.o.s., i would like to bake something. But......., time is not on my side. I find that it flies and nothing(cooking or baking) is done and i am left with all the eggs and we are leaving for Malaysia for a 3 week stay. Have to clean up the fridge. What do you do with so many eggs? As you know, i have made Kuih Lapis Batavia and then decided to make salted eggs. I have never had any luck of good salted store bought. They are usually all over salted and not good eats anymore. For good salted eggs, you would have to make them. I would like to weigh down the eggs in the saline solution but have not been very successful doing it. Any suggestions are welcome. Cook salt and water until salt dissolves. Let saline solution cool. Add in the sichuan pepper corn and brandy or whiskey. Put eggs in a large bottle and pour in the cool, strained saline. Cover tight and leave in the pantry for 3 weeks. Test one by cooking to see if it is ready. If not, continue to steep a few days longer. As soon as one is ready, remove the rest and leave in the fridge but not for long though. I will cook them and then store in the fridge for future consumption. Tips from my dear friend, tt, who taught me how to check if my saline solution is salty enough - drop some cooked rice onto solution and if rice float, then it is good and salty. Tips from neighbor - keep stirring the solution and the salt will not dissolve if the solution is salty enough. The 5th day of the 5th moon should be around the corner and i am sure everyone will be scrambling for recipes. Every dialect or family have their own version of these dumplings. My mil's of just ground pork is so delicious and memorable and i have not been able to come close. 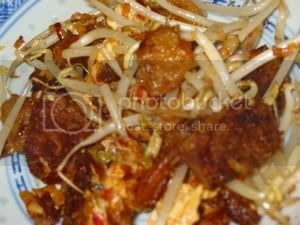 She is Indonesian Chinese and if any readers know of such recipe, kindly share. This recipe is from The Best of Singapore Cooking by Mrs Leong Yee Soo - Kueh Chang Babi. She used screw pine leaves aka pandan leaves but i made using bamboo leaves instead, limiting a tiny piece of pandan leave wrapped with the rice. I too have added cooked chestnuts to the filling as they give a better feel to it. 6 tbsp roasted ground coriander seeds. 1. Soak glutinous rice overnight. Drain and divide into three parts. Steam each part over rapidly boiling water for 30 minutes. Make steam holes before steaming. 2. Remove glutinous rice to a saucepan. Dissolve 1 tbsp salt in 6 f l oz water, Add 1 tsp pepper and pour around the steamed glutinous rice. Mix well. Cover for 10 minutes and mix lard evenly with rice. Keep warm in saucepan with a tight fitting lid. Repeat with remaining glutinous rice.Add a drop of blue coloring to one batch of glutinous rice. 3. Place the pork and pork fat in a saucepan. Pour in 30 fl oz water and bring to the boil. Boil over moderately high heat for 20 minutes then remove pork and fat. Cool, dice and set aside pork and fat, Continue boiling stock till it is reduced to half. 4. Soak chinese mushrooms and cut into tiny cubes. Dice sugared melon. 5. Heat oil in wok and fry the pounded garlic and shallots, adding pork, salt, sugar, pepper and dark soya sauce. 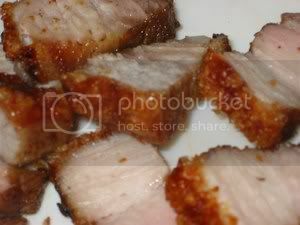 Stir till pork changes color. Add stock, mushrooms, sugared melon and fat. Continue cooking over medium heat for 1/2 hour. 6. Now add the coriander powder and stir well. Reduce heat and simmer till filling is almost dry. Remove to a large bowl to cool. Keep overnight before filling. 7. Soak bamboo leaves in cold water. Cook bamboo leaves in hot boiling water for 10 minutes. Cool, then wipe dry. Take 1 broad or two leaves and fold from the centre to form a cone. 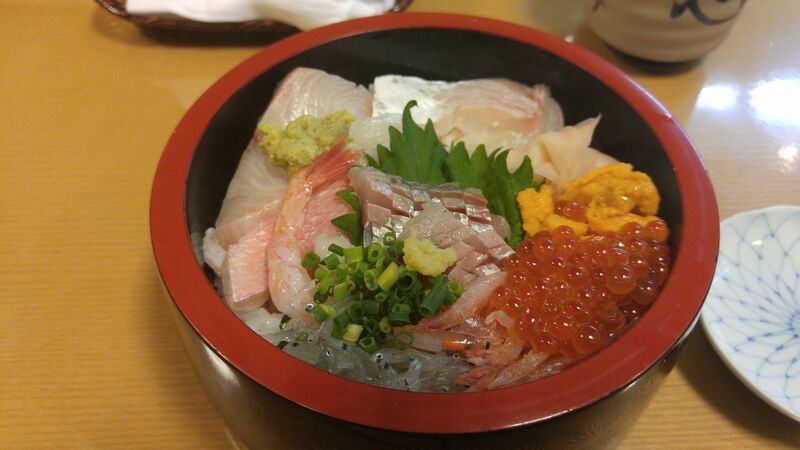 Take a fistful of plain glutinous rice and a dollop of blue rice, line the sides. 8. 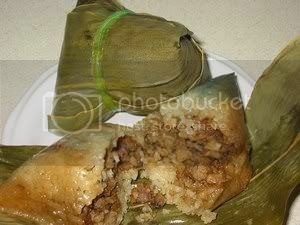 Put 2 - 3 tbsp of pork filling over rice and cover neatly with more glutinous rice. Top with a piece of pandan leave before folding leaf over. Tie tightly with string or raffia. 10. Hang dumplings for 1 - 2 hours after cooking to drip dry, thus preventing sogginess. 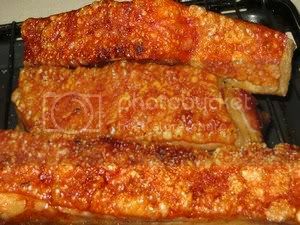 To achieve ultimate cracklings and juicy roasted belly pork, these are my views after attempting making them again. It is not the recipe that is important. The most important factor is to have the proper oven to roast and grill the skin until it crackles evenly. Choosing the right piece of belly pork is equally important. A turbo oven with the fan and heating elements on the cover is most desirable. I do not own one, so when i bought a new microwave oven which has 2 grill functions - top and bottom, i tried making 'siew yoke' again. The result was so good and the skin crackled evenly all due to the turntable which rotates. When there is a failure in anything, i will tend to put the blame on the utensils - like the saying goes - 'A bad workman blames his tools'. In this case, the correct utensil and equipment are the prime factor for success. Choosing the proper piece of meat for this type of roasting is important too. I found that the lean and fat have to be very evenly striped to ensure a flat surface of skin which aided it to crackled. An uneven piece, when roasted will tend to buckle. (note that the piece of meat at the back of picture is all buckled up, it was due to a strip of lean meat which is thicker than the rest).